We are a 5 Star company with literally thousands of positive reviews elsewhere, and will respond to complaints on those verifiable sites but not on Yelp. That is because there is little way for us to tell if the anonymous Yelp reviewer is real, a competitor (that happens), or even a Yelp employee throwing gas on the fire to get advertising dollars as some lawsuits allege. If you are a legitimate customer, please go to a non-extortion site where we can verify your order and respond appropriately. Thank you in advance for your kind consideration. Yelp has been sued many times by businesses claiming the review site tries to extort advertising money in exchange for positive ratings. Yelp is accused of manipulating reviews to hold down ratings of businesses until they pony up thousands of advertising dollars. The public is not well served under the Yelp business model, but rather, Yelp profits. A Federal Court in San Francisco (9th Circuit) ruled in September 2014 that Yelp is within their legal rights to do that, calling it “hard bargaining”. We disagree that a Yelp! shakedown is simply “hard bargaining”. Ratings should not be predicated on hard bargaining. What Yelp does is illegal on the street, but evidently not online. Coerce money from someone face-to-face and go to jail. Do it online with a website and go to Wall Street. Fortunately, Google Adwords does not list Yelp as one of their review board trusted sources and will not display Yelp ratings on their advertising network. They do many others. Wall Street has also soured on Yelp stock as the company as of this writing (February 2015) has lost over half its value (see below). The Yelp business model is seriously flawed. The Yelp ratings algorithm is a ruse for small business shakedowns that is unsustainable long term. 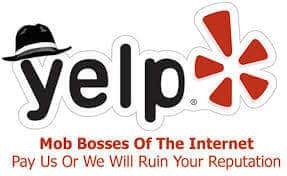 The public will be better served if another company with higher ethical standards takes over Yelp as is rumored. 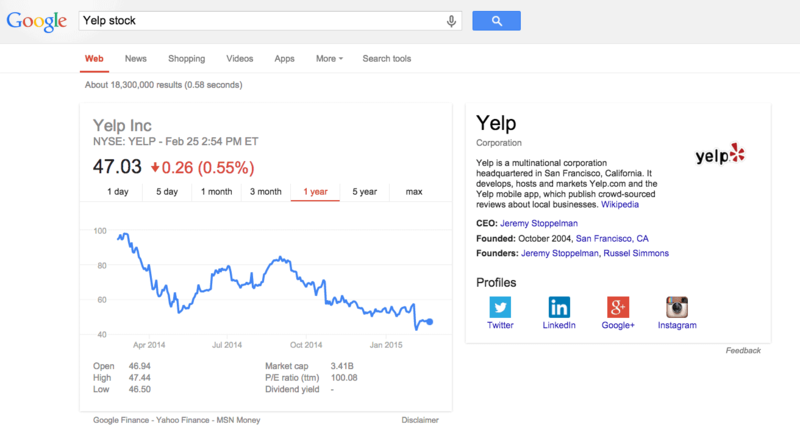 Yelp turned down a Google offer to buy them, and as a result the consumer is worse off for it. Direct Express Auto Transport is lucky that 98% of our tens of thousands of monthly visitors do not rely upon Yelp, which means there is little reason for us to cave to the pressure. Many small businesses, especially local businesses, do not have that luxury. On their behalf, we advise Yelp visitors to take those reviews and ratings with a shaker of salt. Direct Express Auto Transport originated the instant online quote calculator and does not ask for any personal information prior to providing a quote. It is the most sophisticated and reliable car shipping quote engine on the internet. Try it here on this page.